What’s more than a century old, seen many uses and was built as a result of a (somewhat…) healthy brotherly rivalry? The Den at Cave Hill Creek, of course! Tucked away, across the oval behind the Lakeview Lodge there’s a building that has a long history across generations with Beaufort and nearby communities. Here at Cave Hill Creek, we’ve seen so many people and groups come through our gates, sharing lasting memories and experiencing the rich history of the place, and no part of Cave Hill Creek has more history than “The Den”. The building (affectionately) known as “The Den” began its life in 1914, as a new school house for the reopening of the Eurambeen State School (school no 1137). The nearby Eurambeen and Eurambeen East stations were substantial 19th-century squatter’s properties, owned by the famous Beggs Brothers. The brothers shared a (somewhat) healthy rivalry, each building opulent bluestone homesteads, expansive woolsheds, and not to be outdone by each other, schools to educate the children of farm workers. A victim of the depression the Eurambeen State School closed in 1932, and ‘The Den’ was moved to Beaufort State School (School no. 60 – later the Beaufort Primary School). Here it was used as a Sloyd room for manual wood-working and trade-training, providing a haven for students from the monotony of rote-learning and regular schoolwork. During its life as a faculty building in Beaufort, as noted in the Beaufort Historical record; The Den’ witnessed the change ‘from chalk to computers’. It later housed acorn computers and dot matrix printers (remember those?) as part of an early IT classroom. and even served as Tim Chandler’s (current custodian of Cave Hill Creek) grade 1 classroom. So you could say its been in the family for a while! In 1994 the rural recession saw a downturn in school numbers and the Victorian Education Department put the building up for public tender. 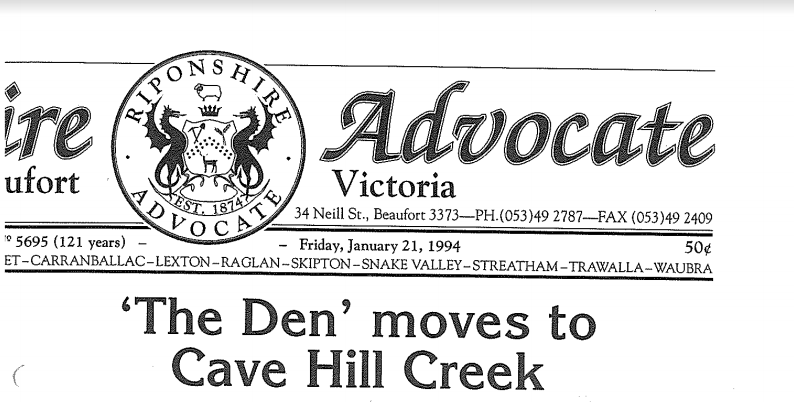 Tim’s parents, Julie and Ian Chandler purchased The Den and moved it to Cave Hill Creek. Restoration and renovation (using hundreds of tubes of No More Gaps) was a summer holiday job for Tim. It has since served as an adaptive room to educate kids on school and summer camps, keeping its long-standing function as an educational building, and paying homage to the rich history that has seen many teachers and children pass through its doors. Today ‘The Den’ has enough room to sleep 10 people and boasts a kitchenette and en suite bathroom. 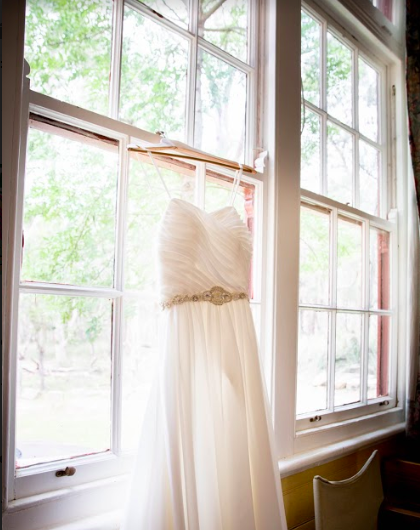 Full of history and character The Den’s lemon timber lining boards, high ceiling, 9-panel triple sash windows and spectacular mountain views serve as the perfect space for a bridal party preparing for their big day at Cave Hill Creek. From the building’s beginning in 1914 as the Eurambeen State School, moving to Beaufort, and eventually ending up at Cave Hill Creek, ‘The Den’ is a building with such a rich history in our community, and we’re glad it is still being put to a good use – a use that maybe even the Beggs Brothers would be proud of! For Next weeks instalment of our ’30 Stories for 30 Years’ series, we’ll take a look at how Cave Hill Creek has become renowned as a great wedding destination, and delve into what makes this place such a unique location to marry your loved-one.